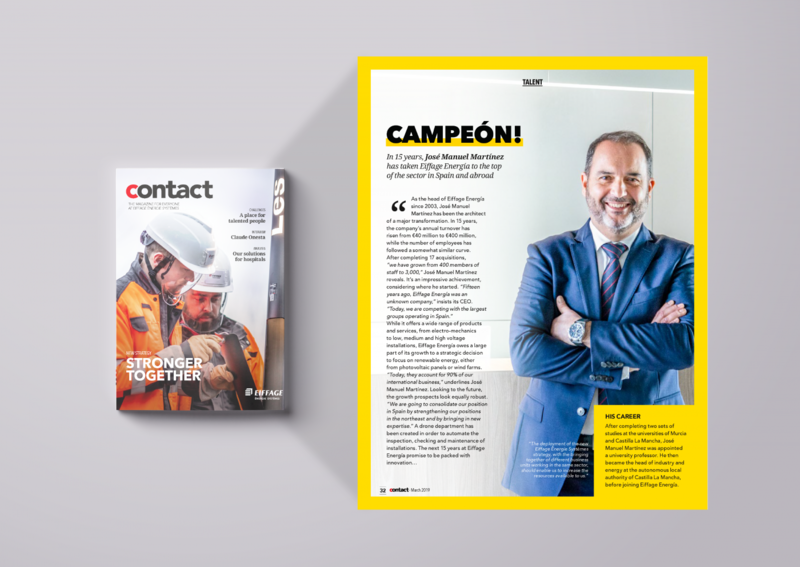 The internal magazine of Eiffage Énergie Systèmes, one of the four branches of the Eiffage Group and of which Eiffage Energía is a subsidiary, in its latest issue interviews the CEO of our company, José Manuel Martínez, who, in fifteen years, has taken the company, “to the top of its sector” both in Spain and abroad. According to the magazine, since 2003 José Manuel Martínez “has been the architect of a great transformation,” emphasising that the turnover has grown from 40 to 400 million euros, while the number of employees has grown apace. “We have grown from 400 members of staff to 3,200“, underlines the CEO of Eiffage Energía,” an impressive achievement, considering where he started”, they affirm in Contact. “Fifteen years ago, Eiffage Energía was an unknown company,” says José Manuel Martínez, who notes that “today, we are competing with the largest groups operating in Spain”. While the company already offers a wide range of products and services, ranging from electro-mechanics to the low, medium and high voltage installations, much of its growth is due to a strategic decision to focus on renewable energy through photovoltaic plants and wind farms. “Today, they account for 90% of our international business”, says Martinez. In the future, the pace will be just as intense: “We are going to consolidate our position in Spain by strengthening our position in the North East and bringing in new expertise (innovations)”. In this respect, Eiffage Energía’s CEO reminds us that a drones department has been created “in order to automate the inspection, checking and maintenance of installations. Therefore, the next 15 years of Eiffage Energía promises to be packed with innovation”.